Former FBI Director James Comey is about to get criticized in an internal review by the Justice Department, and President Donald Trump says he can't wait. WASHINGTON — Former FBI Director James Comey is about to get dinged in an internal Justice Department review of the agency's Clinton email probe, and President Donald Trump says he can't wait. The Justice Department's inspector general is widely expected to criticize Comey and other senior leaders for their handling of the investigation into whether Hillary Clinton mishandled classified information as secretary of state. The Associated Press reported some of the anticipated findings last month, including that FBI officials didn't move quickly enough to review a trove of emails late in the 2016 campaign. Those emails were found on a laptop belonging to former Rep. Anthony Weiner, the onetime husband of top Clinton aide Huma Abedin. Of particular interest is Comey's bombshell announcement two weeks before the 2016 election that the agency was reopening the Clinton email probe after stumbling upon the new material. It wasn't until two days before the election that the FBI announced, for a second time, it would not recommend criminal charges against Clinton. The report is also expected to criticize two FBI officials who exchanged derogatory text messages about Trump during the course of the Clinton investigation and the presidential campaign. The president has depicted the former FBI director as a renegade who breaks protocol, nicknaming him "Slippery James Comey." That portrayal serves a keen political purpose: undercutting the ongoing Russia probe, since taken over by special counsel Robert Mueller. That probe includes a look at whether Trump himself tried to obstruct justice by firing Comey. Any IG investigation challenging Comey's work as FBI director could bolster Trump's argument that he did the right thing by pushing Comey out. It also brings the debate back to Clinton's email server. "When will people start saying, "thank you, Mr. President, for firing James Comey?" Trump tweeted Thursday. He'll also likely point to an earlier inspector general report that accused Comey's deputy, Andrew McCabe, of misleading internal investigators about a news media disclosure. But what if the report doesn't go far enough for Trump? He's already floated the idea that the findings could be watered down and that's why it hasn't been released. Trump seemed pleased Thursday, though, following an ABC News report that the IG could use the term "insubordinate" to describe Comey. "It is all a Democrat Excuse for LOSING the Election," Trump tweeted Thursday of the Russia probe. "Where is the server?" Democrats already blame Comey for his handling of the Clinton investigation because they say it broke with longstanding bureau protocol not to insert itself into politics. Robby Mook, Clinton's former campaign manager, at one point declared "his credibility is gone" in reference to Comey after the election. But Mook and other Democrats were also in disbelief after Trump fired Comey. "Twilight zone," Mook tweeted at the time. "I was as disappointed and frustrated as anyone at how the email investigation was handled. But this terrifies me." It's likely Democrats will search the IG report for justification that Comey's handling of the email investigation was clumsy. But they'll also probably argue Trump really fired Comey because of his agency's Russia probe and Comey's refusal to publicly say the president himself wasn't under investigation. 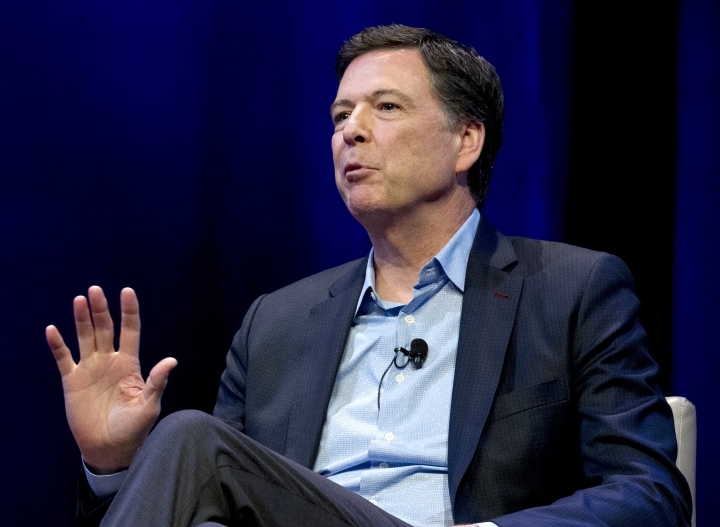 Comey has said he knew it would be unorthodox to alert Congress to a discovery of emails potentially connected to the Clinton case just 11 days before Americans picked a new president. But while that option was "really bad," concealing the new information would be "catastrophic," considering he had testified under oath that the investigation was finished. He has said he felt compelled to advise them that was no longer the case. It's not clear how Comey will respond to the report, but on Tuesday, he tweeted that "facts" have a way of winning out. "It can take a while, but decency and the rule of law inevitably win over demagogues and liars," he said.